Kem Weber (1889—1960), a well-known mid-century architect, was part of the distinctive West Coast modernism movement that helped shaped the relaxed California lifestyle. He influenced California style during the mid-twentieth century with buildings architecture, interior designs and furniture, including his famed Air Line chair, which is part of many museum furniture collections. As chief designer for the Walt Disney Studios in Burbank in 1939, Kem Weber also designed the specialized animation furniture that went into the then new studio complex. The Disney animation furniture, which has been lauded in recent years, was designed for specific animation disciplines with input from the artists that would be using it. It was all part of Walt Disney’s desire to create an efficient utopian campus for animated film production. 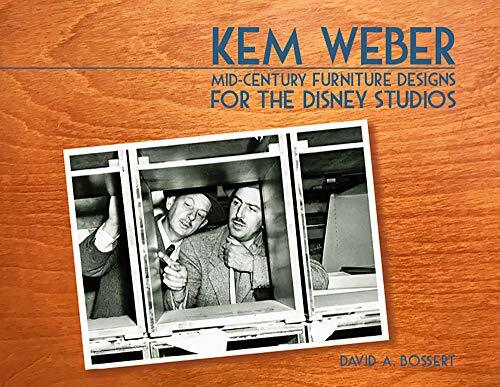 This book is a comprehensive overview of the Kem Weber designed Disney animation furniture that takes the reader on a journey from concept sketches and photos to interviews with legendary artists. David A. Bossert celebrates and details the form and function of this unique mid-century furniture and the impact it had on the Disney animation process over the decades.